I’m loving these debug it activities. It is a great way to teach problem solving strategies and lateral thinking. It is also a great way to introduce need coding concepts. 1st try- move define block code to stage… no change. 2nd try- copy define block code over to Gobo… no meow. 3rd try– drag sound “meow” from Scratch sound window to Gobo sprite icon. Success! The original counting code was set to always repeat (10). I dragged the blue (answer) oval into the repeat block. (And I added a trumpet sound when scratch is finished– Just because). The original code has no pauses after each talk statement and the broadcasts to call the other sprites are sent in no particular order. Add a wait 1 second after each statement and broadcast. Place the podcast block for each sprite directly after Scratch calls them. For the auditorium block I added a show block just before the dinosaur. 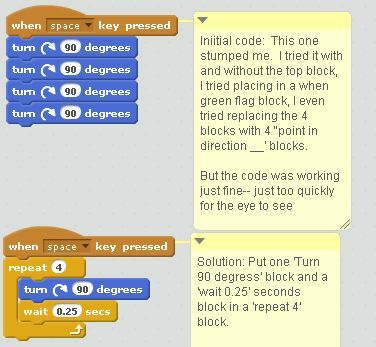 This entry was posted in Creative Computing Online Workshop, PD, SCRATCH, Uncategorized and tagged ccow, Debug It, scratch, Week 2 on June 10, 2013 by mrmcgaughey. 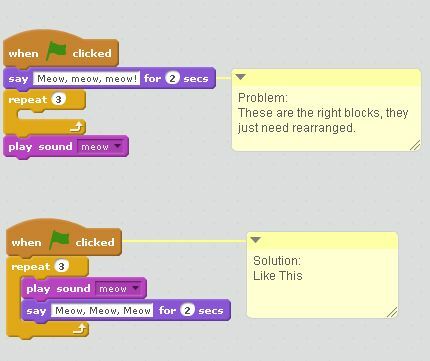 Debug each of the five Scratch programs in the Week 1 Debug It! studio. My solution: This was an easy one. I clicked on the sprite for gobo and it’s script did not have a ‘when green flag clicked’ block on top of the code so I added it. My solution: At the beginning of the script, right after the ‘when green flag clicked’ block, I added a block to ‘go to x:-120, y:0’. This will give him a starting position on the left. Iniitial code: This one stumped me. I tried it with and without the top block, I tried placing in a when green flag block, I even tried replacing the 4 blocks with 4 “point in direction __’ blocks. Then I tried it with only 3 blocks and the problem became apparent. The code was working just fine– just too quickly for the eye to see. Solution: Put one ‘Turn 90 degress’ block and a ‘wait 0.25’ seconds block in a ‘repeat 4’ block. In this project, the Scratch Cat should pace back and forth across the stage, when the Scratch Cat is clicked. But the Scratch Cat is flipping out — and is walking upside down! How do we fix the program? Another simple fix. Click on the little blue ‘i’ on Sprite 1 below the stage to open up sprite properties. Change rotation style from the circle (360 degrees) to the <-> symbol. It will now just turn left and right. In this project, when the green flag is clicked, the Scratch Cat should say ‘Meow, meow, meow!’ in a speech bubble and as a sound. But the speech bubble happens before the sound — and the Scratch Cat only makes one ‘Meow’ sound! How do we fix the program? Are there any obvious errors in spelling, order or logic? How can I work around the errors? Obviously it is more desirable to fix the problem, but sometimes a workaround will allow you to achieve the intended results (although it may not fix the underlying problem, and it may create more problems). In answer to the second question, I would help someone debug a project by saying the above internal dialogue outloud, so that they can see that debugging is a process of asking questions and trying out different solutions. This entry was posted in Creative Computing Online Workshop, PD and tagged ccow, Debug It, scratch, scratched, week1 on June 5, 2013 by mrmcgaughey.